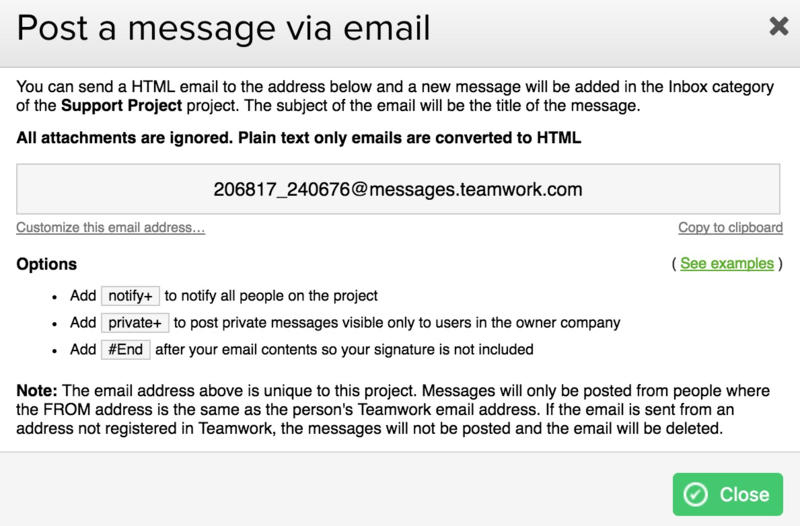 Within Teamwork Projects, each project has a unique email address that allows you to send emails to be added as a new message in that project. To locate this email address, go to the Messages section of the project. Near the top right, click the options (three dots) button, and select Post a message via email. Here, you can copy the email address using the Copy to clipboard link, or just by highlighting the text and using ctrl / cmd + c on your keyboard. You can also edit the email address to use something more memorable from this screen. Note: If you change the address, this will affect all project incoming email addresses for tasks, notebooks, and other items. Add [#Category] in the subject line to post the message in a specific category. The category needs to be added before subject name. Messages created from emails will be added in the Inbox message category. Attachments will be saved with the message. Only emails sent from your email address(es) registered on your profile will be accepted. Attachments on emails forwarded through iOS mail app do not work, however photos or documents sent directly from an iOS app will work okay. Microsoft Exchange servers sometimes attach attachments as winmail.dat which are ignored, see Microsoft article for details here. Note: This feature is not intended to be used to post messages from automated systems that could generate hundreds of messages. Abuse of the message-by-email feature is likely to result in emails being blocked.